Hello <<Preferred Name>>, here is your CommUNITY Weekly newsletter from Deaf Aotearoa's <<Your local Office>> office. This workshop will be provided across the country. It explains the restructure of Deaf Aotearoa, our new service model and what that means for you. You will be able to meet some of the Leadership Team and Executive Board members who will be there to answer any questions you have. There are lots of exciting changes but we understand that you want to know more about them. This is your chance to come and hear what we are doing, why we have made changes and how you can benefit. It is a good opportunity for you to ask your questions directly to people who can answer them for you. Some locations have different times available to choose from. If you want to attend one of these times, please contact your local office to complete an enrolment form and book your place as soon as possible. We need you to register for the workshop to make sure that we have enough space, resources and refreshments. We expect these workshops to be popular, and if demand is high we may need to limit numbers so please book early. If these workshops are full and we need to arrange more workshops then we will. *NOTE: Venue/date/time may be subject to change depending on number of attendees, if in doubt please contact your nearest local office or check the Facebook event. 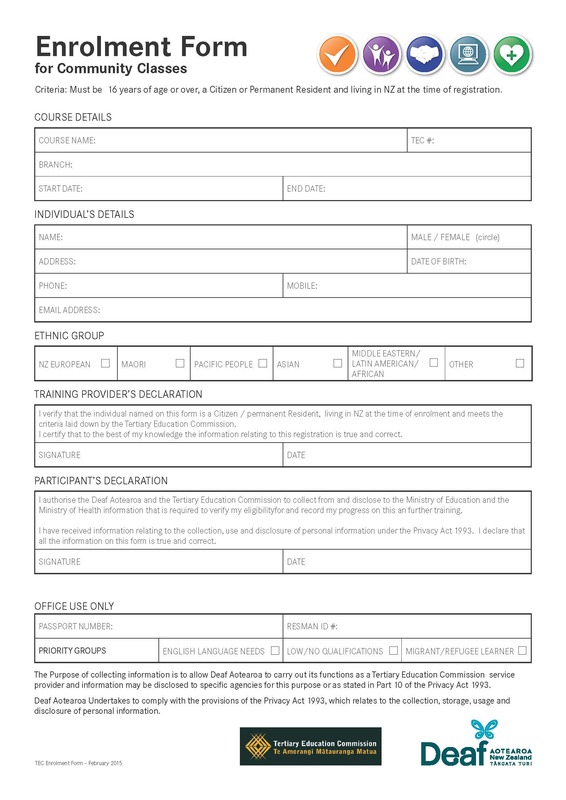 Click the enrolment form below to download a copy. Please return the form to your local office as soon as possible. Come along to the community craft market where there is a whole range of goods that includes: Local olive oil, Kauri products, Paua and shell products, Jewellery, Knitting, Books, Aprons, oven mitts, Fresh local produce and free range eggs, Homemade jams and pickles and more! Where: Mangonui Hall, 132 Waterfront Drive, Mangonui. New Services, New You - New Date! *NOTE: Venue/date/time may be subject to change depending on number of attendees, if in doubt please contact your nearest local office or check the Facebook events. Due to a high demand, “A Minute To Win It” is back again this week. Auckland Deaf Youth Group has created lots of homemade activities to compete with other teams. Come and join in on the fun! This is an exciting development that has come about as part of Auckland Council’s new Long Term Plan for the next 10 years. From August 29th, our library will open on both Saturday (10.00am-4.00pm) and Sunday (12.00pm-4.00pm). The new opening hours mean that people in areas close by to Avondale library will now have the option of finding a 7-day a week library open near them. For more information on opening hours, visit the Auckland Libraries website http://www.aucklandlibraries.govt.nz/EN/About/locationandhours/Pages/locationandhours.aspx or download our new Auckland Libraries’ mobile app from your phone’s app store. 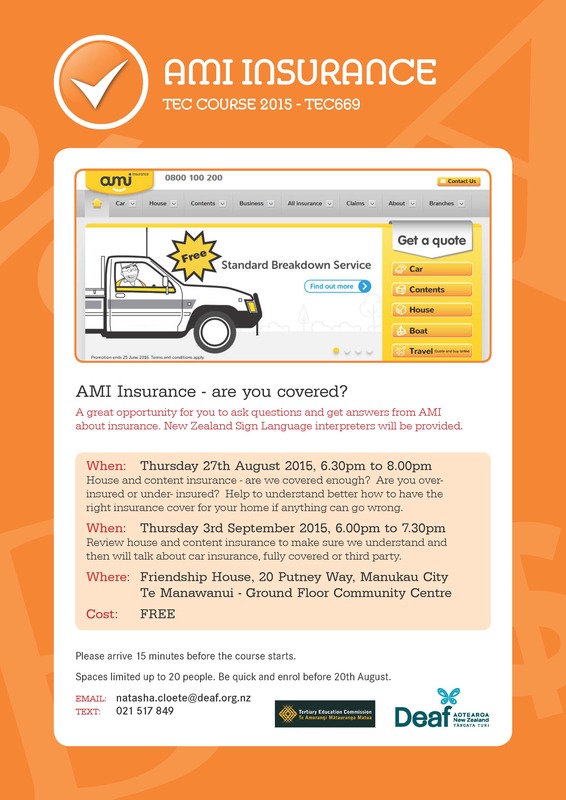 This is a great opportunity for you to ask questions and get clear answers from AMI about insurance. A NZSL Interpreter will be there. We have two dates for this course and each night cover different topic. House and content insurance, are we covered enough? It is a perfect opportunity for people who own a house or planning to buy house and will soon need to have house insurance. Are we over-insured or under insured? For your home if anything goes wrong. This will be a preview of what we talked about last week and then we will talk about content and car insurance to make sure you fully understand how to be fully covered or have 3rd party. To enrol, please email or text Natasha Cloete, all the information is attached. Or you can pop in our office and put down your name for this course. You can come to both or just one, whatever best suits you. Auckland Zoo has teamed up with New Zealand Sign Language interpreting students​ who will interpret Auckland Zoo's animal encounters on four Saturdays over the coming months. 8th August, 12th September, 10th October and 14th November. Come along and be part of the exciting conversation with the animals! Hillpark School, James Cook High School, Leabank Primary School, Manurewa West Primary School, Papatoetoe West School, Randwick Park School, Roscommon School and Rowandale School. The work is during normal school hours. 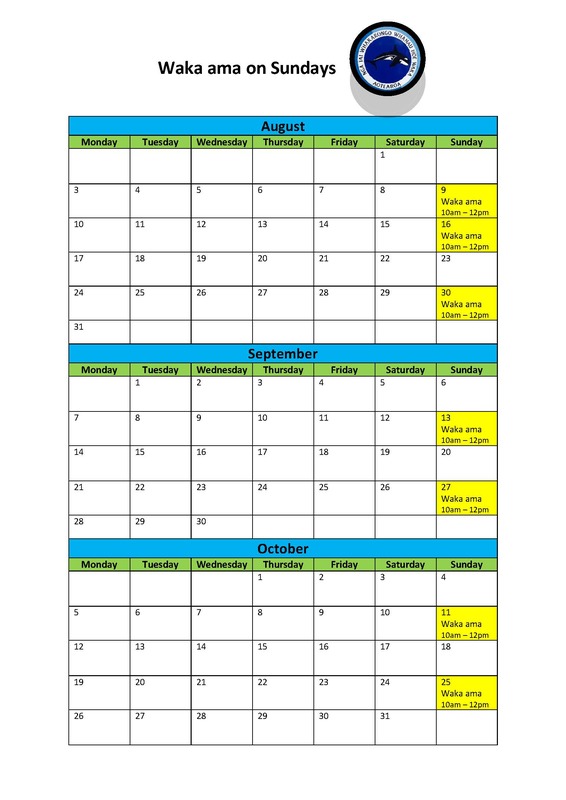 The positions are for a 40 school week fixed term period commencing Monday 12th October 2015 until Friday 23rd September 2016. 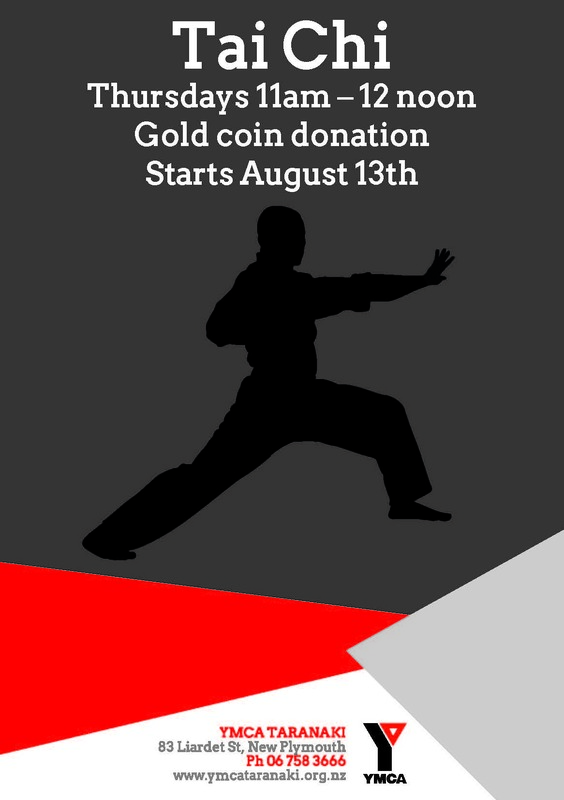 This project is partially funded by Work and Income through MSD Flexi Wage in the Community. At the end of the project, all successful applicants will be assisted by Work and Income staff to find other employment. There is no guarantee that the teacher aide positions will continue after the end of the project. Successful applicants will be required to work with teachers and students in a classroom environment to assist students with literacy and numeracy skills, prepare teaching resources and other duties as requested by the school. A job description and training will be provided by each school. The rate of pay will be $15.60 per hour. The successful applicants will work 15 hours per week in schools commencing 12th October 2015. Successful applicants will be able to participate in study towards the NZQA Teacher Aide Certificate with study commencing February 2016. All successful applicants will be required to complete a satisfactory police vet and be available for interviews on Monday 7th September – Thursday 10th September 2015. If you are interested in applying for one of these positions, please contact Jane Crown at: Jane.Crown@deaf.org.nz to arrange a visiting time to any of these schools listed below. Completed applications may be “posted” in the Teacher Aide Applications Box at each school office. Applications close Wednesday 26th August 2015 at 12 noon. 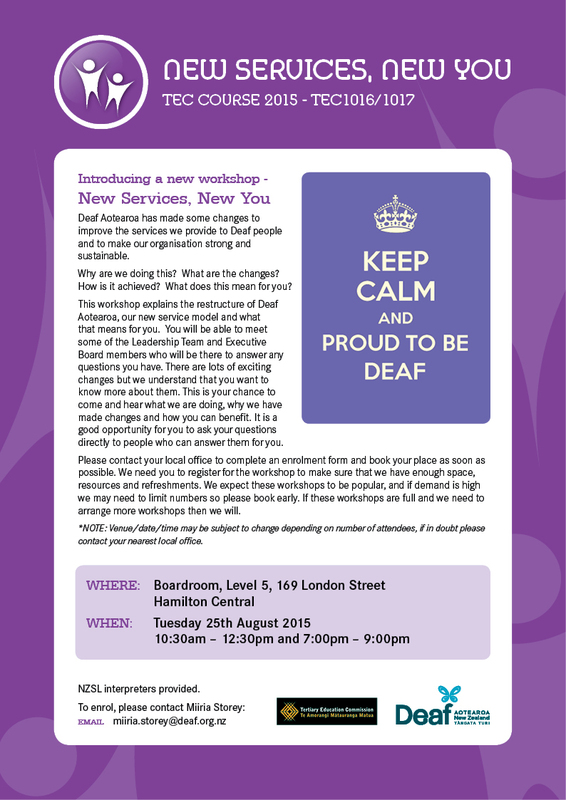 This work shop explains the restructure of Deaf Aotearoa, our new service model and what that means for you. You will be able to meet some of the Leadership Team and Executive Board members who will be there to answer any questions you have. Bring your crafts and unfinished projects and get some work done! Cost: Free! Tea, coffee provided. Please come and support our community, Deaf and hearing ladies are welcome! We are making some changes… and we want your feedback. New Zealand Deaf Games in January? Separate competitions for CODA, Interpreters and other friends of the Deaf? 3-Day timetable or 5 Day-timetable? Where: Brian Perry Sports House, Hamilton. Where: Nga Tai Whakarongo Waka ama club. Address: Roose Commerce Park - Grantham Street, Hamilton. Bring: Warm change of clothes (might get wet), water bottle, snacks if needed. 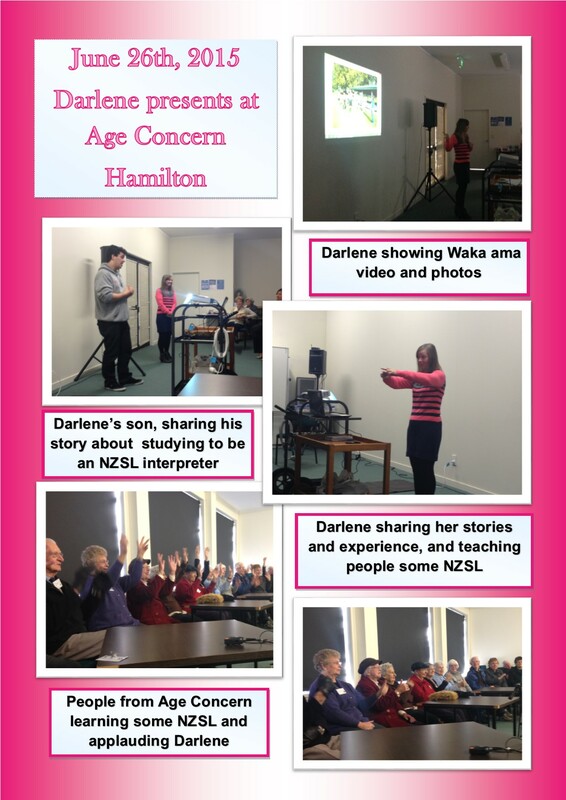 On Friday, 26th of June, Darlene Russell visited ‘Age Concern’ in Hamilton to present to a group senior citizens there. Darlene talked about her life and what it was like growing up being Deaf. 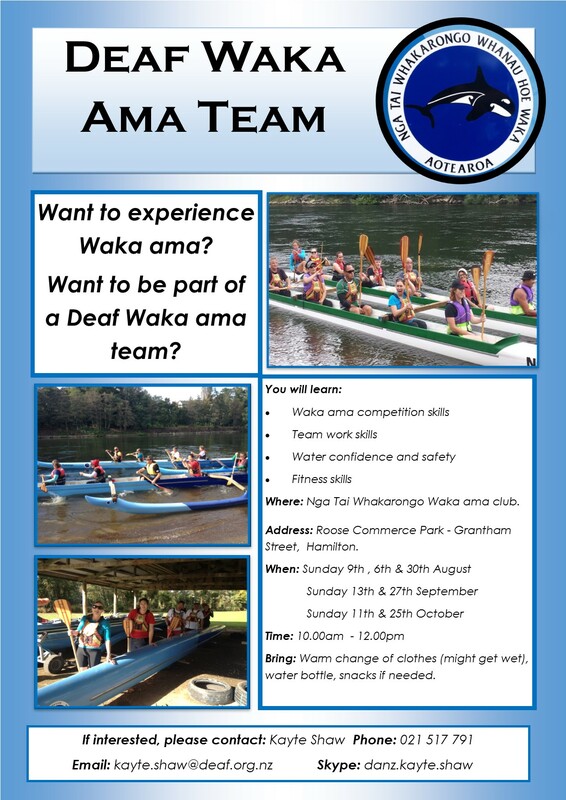 She shared some pictures and videos of her Waka ama experience in Hamilton, and also taught some NZSL to the group. Darlene’s son, Dale, who is currently studying to be an NZSL interpreter joined Darlene and shared his story about growing up with Deaf parents, and about his current studies at AUT University. The group at Age Concern really loved Darlene’s presentation. They learnt a lot, asked lots of questions, and many are keen to learn more NZSL. Well done to Darlene for her presentation. We encourage more people like Darlene to get out there and share their stories and experience, as it really helps raise awareness in the general public about Deaf culture, language and life. Last week, Tauranga and Rotorua had workshops, New Services, New You explaining the new structure which Deaf Aotearoa is providing now for better services to the Service Users. The PowerPoint workshops were interesting with having the attendees questions answered and the outcome is very positive. Thank you to those who have attended and Deaf Aotearoa is looking forward to working with everyone. Get your name in as first come first serve quickly for free tickets. Ticket costs will be announced later. Plan a ladies outing and visit New Zealand’s special event for women. There will be more than 140 companies involved from jewellery and beauty to business products and information, crafts, fashion, fitness, food and wine sampling and much more! Have fun! There will be some different spoken language International films with English captions shown. Deaf Aotearoa has made some changes to improve the services we provide to Deaf people and to make our organisation strong and sustainable. Why are we doing this? What are the changes? How is it achieved? What does this mean for you? The workshop explains the restructure of Deaf Aotearoa, our new service model and what that means for you. Please check flyer for more complete details. To provide an opportunity for students and the wider community to access training and career information to help them decide on their career paths. 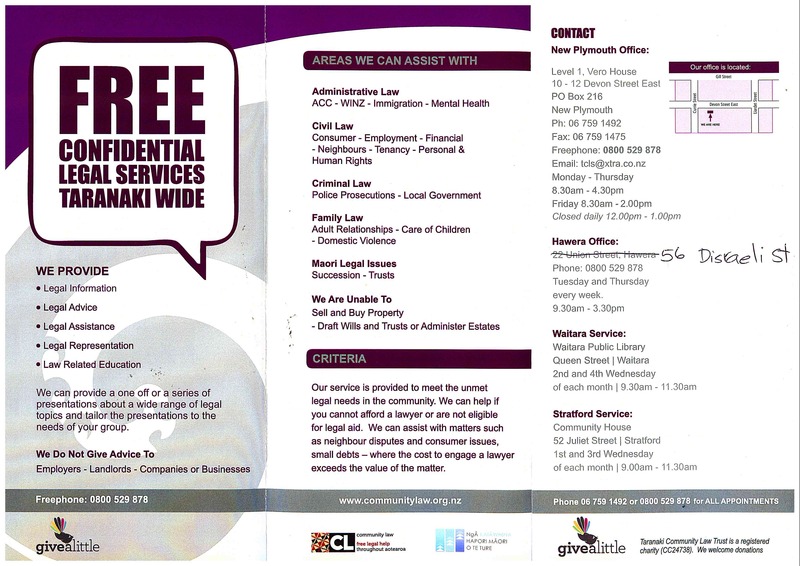 Taranaki Community Law – Free interpreter services available! Taranaki Community Law is pleased to announce if you require their services; these will now be fully funded for an interpreter. They will however require advance warning – they suggest 1-2 weeks. They are also offering a free service “Enduring Power of Attorney”. This can be very expensive at a lawyer’s office – so keep this in mind. Everyone should have one of these in place. Their Hawera office is on the move – 56 Disraeli Street - is their new premises. Please see attached flyer for their locations around Taranaki and office hours. *Watch this space for Education courses run through Taranaki Community Law – these will also be held with an interpreter; fully funded. Where: Blind Foundation, 131 Vivian Street, on the one way. Ironside text: 027 262 9420 will collect and drop off, must book first. Just a reminder that Deaf Aotearoa has great resources for the Deaf and hearing community. Some are free and some you can borrow to use or read/watch at the Deaf Community Access room. The resources available are DVDs, magazines, pamphlets, NZSL resources/ links, interpreter services plus more. You can also visit our website and visit the Deaf Aotearoa shop for more resources. Contact or visit us if you need more information. Come for coffee or hot chocolate, a toasted sandwich, Maori Bread and more... Even some crystals, dream catchers and readings. Plants for your garden, wood art, knitwear, jewellery, toys, linen, and lots of new and used items not mentioned. Never too early to start Christmas shopping or treat yourself. The Magpies first home ITM cup match of the season and pending the Bay seeing off the Ranfurly shield Heartland challengers could be a chance for the Taniwha to get their hands on the shield for the first time since 1978. We would like to ensure that when you have a meeting at Work and Income NZ, hospitals, GPs (Doctors), specialists, court case, police and more, please make sure that you advise them to request an interpreter, if you have a “I am Deaf” card, their contact details will be on there, if you do not have a “I am Deaf” card please notify Lianna who will be able to assist you with getting one. We also have iSign business cards that you can take to give to the person to contact with iSign to book a NZSL Interpreter. You can also request a preferred interpreter, in the event they are available. If they are not available then they can either reschedule another time or use another interpreter who is available. It is very important that we raise awareness at government organisations that this is important to ensure every Deaf/Hard of Hearing can access all information. It is not recommended for family members, friends and other people to communicate for you because this is sending the wrong information, also you will miss out vital information. If you are unsure, you can contact Lianna to discuss this with you or contact iSign directly. If you know anyone who would like to receive our weekly newsletter and/or Talk Hands magazine (published every three months) please direct them to our website http://www.deaf.org.nz/support-us/membership to download the membership form and send it to the local Deaf Aotearoa office, or they can come in and collect a form from us. You will be aware that we have a community computer at our office for you to use. In the future you will need to book when you wish to use this; you can book for a maximum of one hour. This is to ensure that the computer is used fairly by everyone. You can use the computer to update your CV, do cover letters, send emails, create newsletters/fliers and much more! You can either text Lianna on 021 278 8804 or email on lianna.kennedy@deaf.org.nz to see if the date and time you wish to use the computer is free and to have it booked, or you can come in and put your name down on the weekly booking which is on the computer desk. We had our workshop last week. It was great to see the community members come along to learn about the changes and why the changes occurred, what service is available, how the process will work etc. There were quite a few questions asked which was good because they were learning more and getting familiar with the new services. We have had positive feedback from this workshop and we look forward to working with you all to achieve your goals! 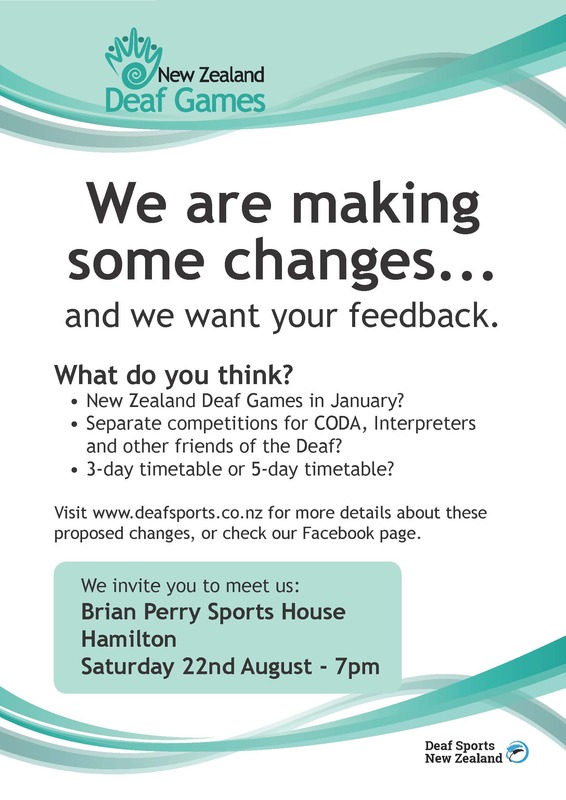 Email: lianna.kennedy@deaf.org.nz to setup a time to meet. Mamma Mia show is performing at the Regent, Palmerston North from 14th August until 29th August 2015. Wellington and Manawatu* ladies welcome! Self Defence is for every woman or girl regardless of age, size, fitness, mobility or strength. Every woman or girl is able to learn effective skills, techniques and strategies that will help keep her safe. Females will learn to think confidently, speak strongly and use self defence skills when necessary. How to think their way out of threatening situations. The course style is participatory, practical, fun and empowering. It includes discussions, games, physical sessions and role-plays. Morning and afternoon tea will be provided, please bring your own lunch. Interpreters will also be provided. *we have funding to cover up to two vehicles travelling from Manawatu – please contact Lianna to organise transport. Please complete TEC enrolment form attached if you wish to attend. Click the enrolment form below to download a copy. Please return the form to your local office as soon as possible. Contact Jake for further information. A reminder to remind you all that the deadline is on the 16th. Please go to the website and fill out a form for the awards and dinner night. 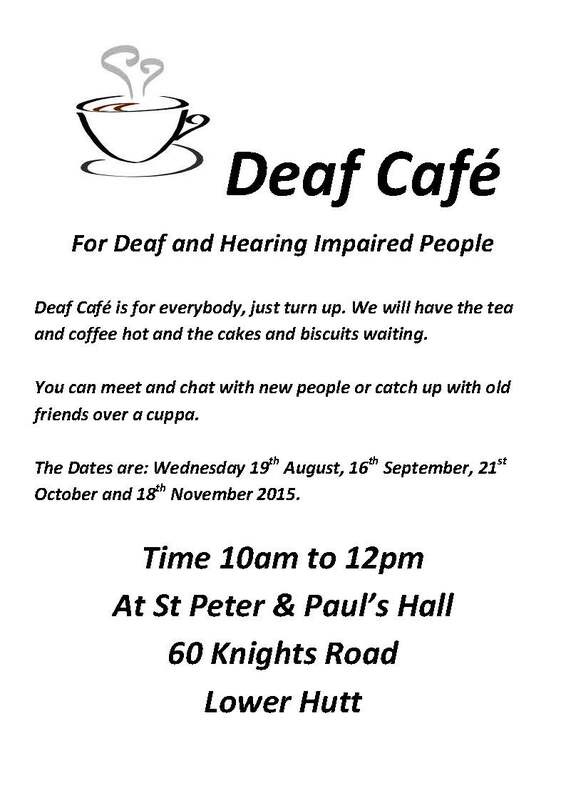 The Deaf Café is for everybody! There will be hot tea and coffee as well as cakes and biscuits! Hi, my name is Alison Kimberley. Most people refer to me as Ali. 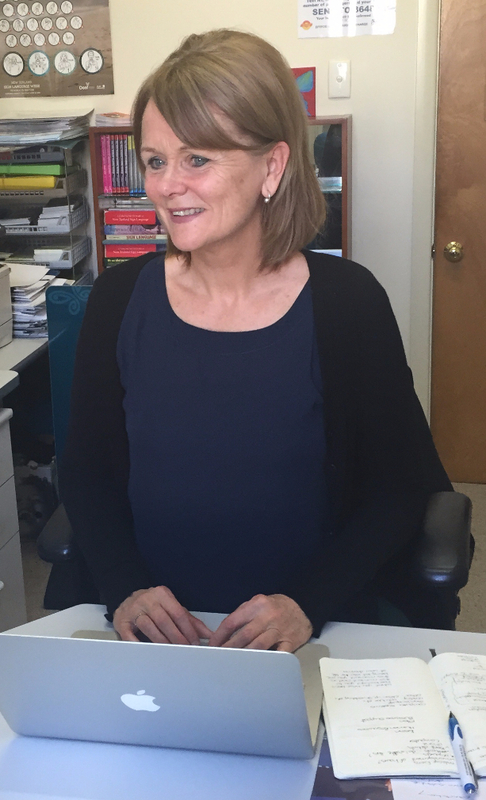 I am pleased to have begun employment with Deaf Aotearoa. My role is Facilitator for First Signs and Youth. My daughter, who is now an adult, was born deaf so I have enjoyed involvement with the deaf community for many years. 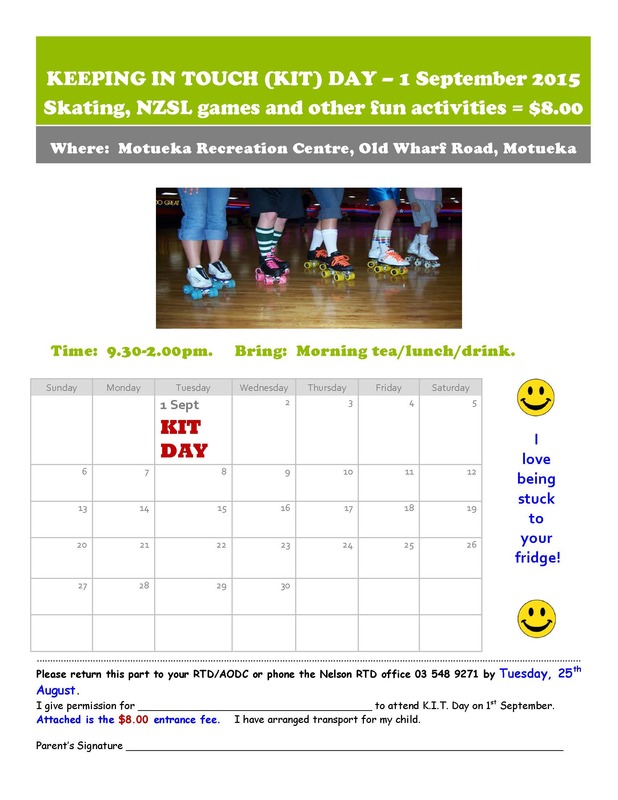 You are welcome to come along and meet the Deaf children in our Nelson area, there will be fun activities which include Skating, Badminton, Table tennis. Nelson Deaf Community Inc are having a fun afternoon at indoor mini golf at Road Hogs. Do You Need Assistance with Employment or are You Looking for Employment? If you need some support, please visit the Christchurch Deaf Aotearoa office. Do you find hard to find your local news when you received our weekly newsletter? Do you find our newsletter too long until you found your local? If you need assistance with Community Newsletter - please visit the Christchurch Office. The New Zealand International Film Festival is a national event covering the cinematic options of audiences and filmmakers throughout New Zealand during the month of August from 7th to 23rd. 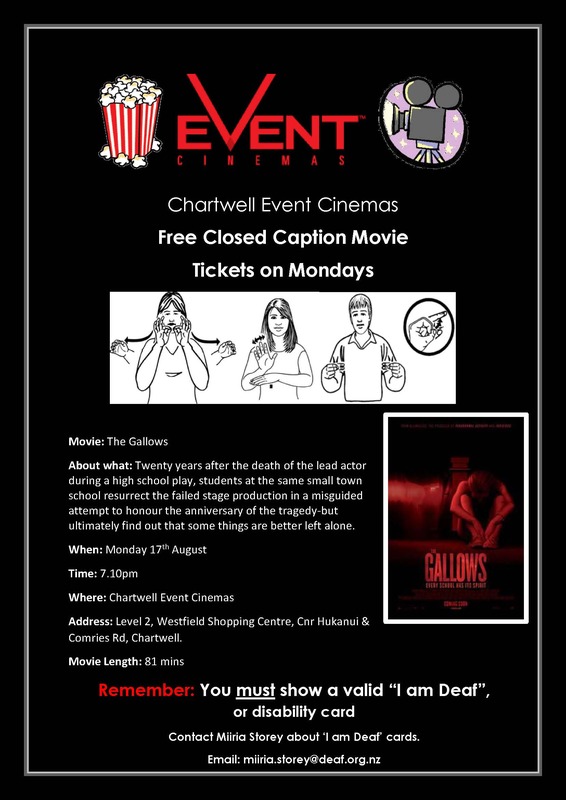 A programme will be presented around NZ and Christchurch will be showing international films either with captions in English or no captions. 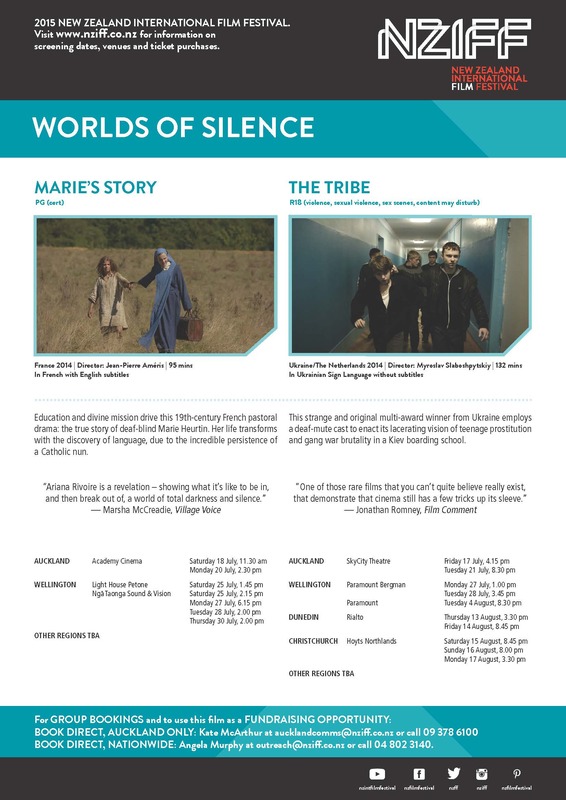 There will be two international films with a theme of "Worlds of Silence" for deaf community at Hoyts Northlands mall in Papanui. More information on Marie's Story and The Tribe films, please see the flyer. Deaf Sports New Zealand - TONIGHT! 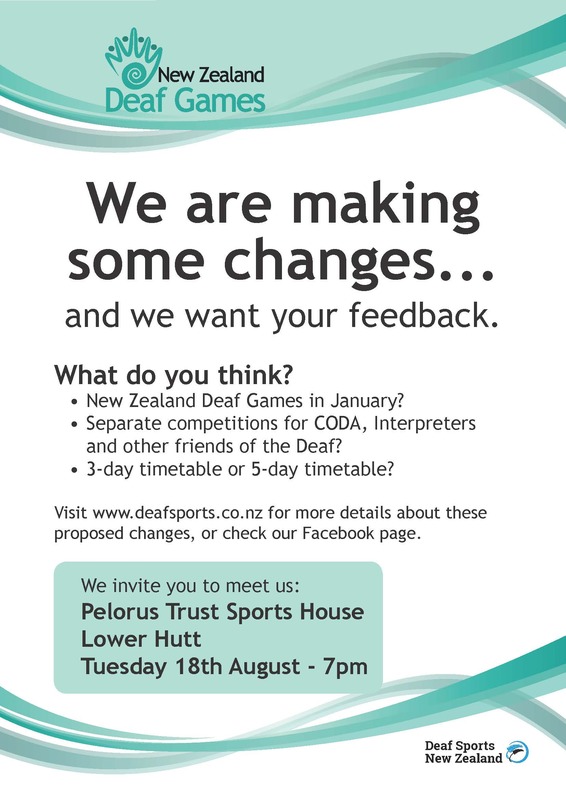 Deaf Sports New Zealand would like to invite you to attend a meeting to see what they are making changes for our annual New Zealand Deaf Games, please see flyer for more details. Have you got your ticket yet? The sale for the ticket have been extend until 16th August 2015 - be quick to purchase your tickets! 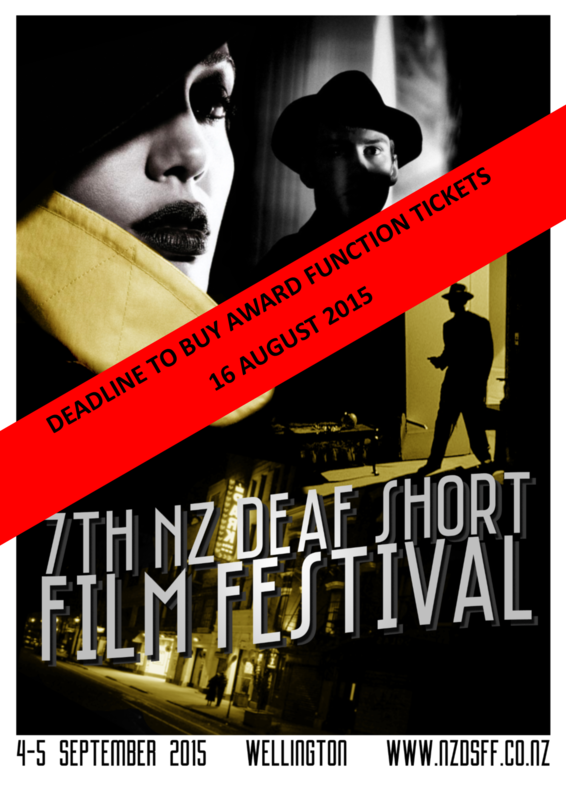 Deaf Short Film Festival are selling festival tickets for $80.00 and this will include a free screening of your choice. Mark your calendars for a new workshop! Deaf Aotearoa has made changes to improve the services we provide to Deaf people. This workshop will explain the restructure of Deaf Aotearoa, our new service model and what that means for you. A member of the Leadership team will be there for questions. Refreshments and interpreter provided. You are invited to a great get together for parents of pre-schoolers who are deaf/hearing impaired. Michelle is out of office on Friday 21st August. To be held to farewell Roger Strong before he leaves to represent New Zealand in the Deaf Lawn Bowls team in Northern Ireland. RSVP: Philippa Evans to let her know if you are coming. Wear something Green as the theme for the night is Irish! 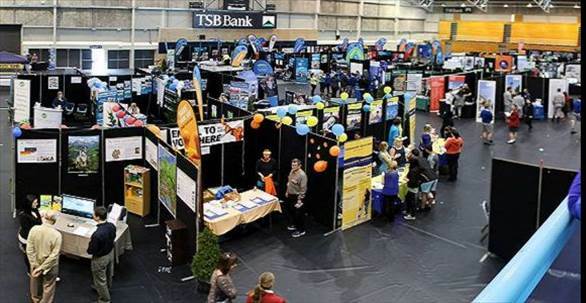 Invercargill’s No#1 Community Market with 30+ stalls each month including: food, crafts, art, entertainment, free activities and more. It is held on the last Saturday of each month.